Out of the toxic waste dump of the Watergate scandal in the 1970s, Congress established strict restrictions on campaign financing to root out corruption in Washington. But in the 40 years since the historic reforms, the Chamber of Commerce and the Supreme Court have hacked away at government oversight with their First Amendment sickles. The Supreme Courts abstract leap in Buckley v. Valeo equating money with free speech has, in application, ushered a political world where one must "pay to play" -- affording the rich instant access to power and influence and decimating our faith in democratic government. Politicians are beholden to their wealthy donors in order to raise millions of dollars for costly elections. In turn, Congress seems far more intent on keeping corporations and Wall Street happier than their own constituents. Polls from last year show more people favor Darth Vader than Congress. Most Americans describe our government as "dissatisfying" (74 percent), "unproductive" (74 percent), and "corrupted" (75 percent). Another disheartening bit of news: The Koch Brothers just pledged to spend almost $1 billion to "play" the upcoming presidential election in 2016. Let the resulting cynicism flow. But what we can't do is let these negative views curdle into political indifference. Nixon's resignation was a national nightmare but out of that scandal came a sobering recognition that our government needs to be checked. Alexis de Tocqueville, who was critical of America in the 1800s, cautiously leaned towards an optimistic view of our democracy's hardiness: "The greatness of America lies not in being more enlightened than any other nation, but rather in her ability to repair her faults." We the people know better than to wait for another Watergate scandal to wake up and fix our government. We need to end "legalized bribery" (John McCain's words) today. If Congress and our Supreme Court have become puppets to big money, ordinary American citizens must come together and take back our democracy. Already a large movement with over 140 organizations has begun to thwart the Supreme Court's thoughtlessness. Almost 5 million people have signed a petition calling for a Constitutional amendment to end the big money dominance of our elections. Sixteen states, more than 600 cities and towns and more than 200 members have joined this call for a 28th Amendment. 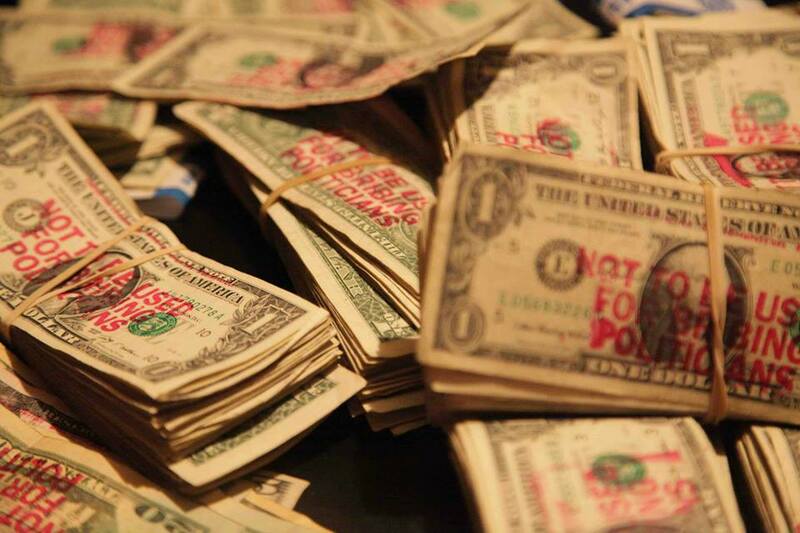 In 2012, I started the StampStampede.org to help build this movement. We now have over 30,000 people around the country legally stamping U.S. currency with messages like "Not to be used for bribing politicians" and "Corporations are not people" to turn their money into media and educate the public. Each stamped bill that circulates is seen by approximately 875 people. That means if 1 person stamps four bills a day for a year, the message will reach 1 million people. With tens of thousands of people stamping, we're creating a visual petition on steroids that Congress cannot ignore. In Nixon's resignation speech, he said his wrong "judgments" were "made in what [he] believed at the time to be the best interest of the nation." His best intentions were devastatingly wrong. The Supreme Court's philosophical convictions about unlimited corporate spending as free speech were worse. Most people understand that big money in politics has corrupted our democracy. The important thing now is to demand that something be done about it. If the Supreme Court has decided that money is free speech; we at the Stampede are literally going to make our money SCREAM.